What mouthwash do you use? Oracare Mouthrinse has no alcohol, no sting, color or sugar yet it effectively eliminates strong mouth odors while providing a pleasurable gargling experience. It's extremely gentle so you can use it everyday. 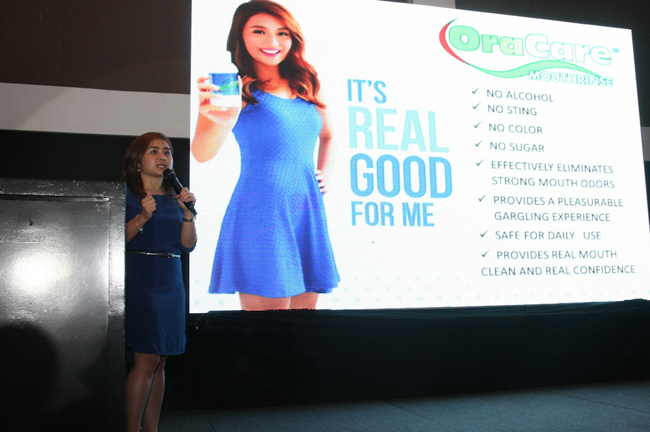 This is one of the many reasons why OraCare is the mouthwash of choice for teen queen Kathryn Bernardo. At a launch held at 55 Events Place in Quezon City several days ago, Kathryn was launched as their official brand ambassador. Also present was OraCare’s Brand Manager Guia Talag who shared with everyone why OraCare is the better choice over alcohol-based mouthwashes. OraCare Mouthrinse is awarded a Guinness World Record for Most Number of People Simultaneously Gargling with Mouthwash after beating Ontario, Canada’s former record. For more info on Oracare and the launch of Kathryn Bernardo as their brand ambassador, connect with OraCare on Facebook.